Is the Mormon Prophet Like the Catholic Pope? The Pope is the head of the Catholic Church, while the Savior leads The Church of Jesus Christ of Latter-day Saints, through a living prophet ordained by priesthood authority, and whose members are sometimes called Mormons. There are both similarities and differences between the two positions. To understand the role of a prophet, one must first understand how the highest levels of the Mormon church is organized. At the head of the church is the prophet. He is assisted by two counselors (advisors) who share the workload and are chosen by the prophet himself. No one seeks for the position or campaigns for it. The prophet alone makes the choice through prayer and inspiration. 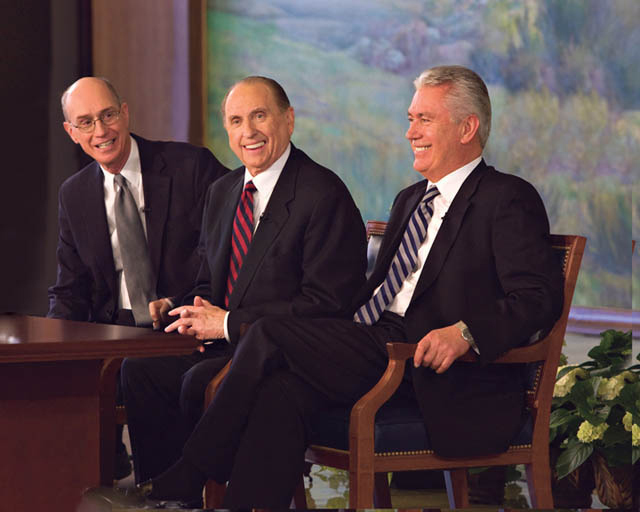 These three, known as the First Presidency, oversee the workings of the worldwide church. The next level of leadership is the Quorum of the Twelve Apostles. They, like the First Presidency, are seen as prophets and they also have an intense workload in helping to lead the church. They are organized by seniority based on how long they’ve been an apostle. One way in which the Catholics and Mormons differ is in how their highest leader is chosen. For the Mormons, there is no suspense, no voting, and no ceremony. While Catholics watch for smoke to let them know a choice has been made, Mormons already know who will lead them the moment the previous president dies. The process follows an established pattern and offers no surprises. The first presidency is dissolved at the moment the president of the church dies, and the apostles are then officially leading the church as a body. At this moment, there are generally fourteen apostles, not twelve, since the two counselors are apostles as well, and they return to their place in the quorum. The highest ranking apostle, known as the president of the Quorum of the Twelve, leads the apostles. A meeting is held among the apostles, in which they discuss two options. One is to reorganize the First Presidency immediately. The other is to wait, and allow the apostles to continue leading for a time. Once the decision is made to reorganize, the new prophet is selected in a unanimous decision by the apostles. The new prophet has always, from the beginnings of the church, been the longest serving apostle, which is why there is no surprise. Everyone knows who to expect, long before the need arises. The prophet chooses his new counselors and the First Presidency is organized and the apostle who has served the longest after the prophet is the new head of the Quorum of the Twelve. If that person was chosen as a counselor, the longest serving apostle not in the First presidency becomes the acting president of the Quorum of the Twelve Apostles. Later, the new prophet will select a new apostle to fill the vacancy in the Quorum. Prophets have been authorized to speak for God from the earliest days of the Earth. Through Noah, Moses, Elijah, and others, God has communicated the teachings and requirements of His gospel through those chosen by Him. When the Church was restored, it naturally required a prophet, and there has been one leading the church continuously since its restoration in modern times. The prophet is the only person who can receive revelation for the entire church. Each person in the world can, if he or she is worthy, receive personal revelation for his own life and anything he is responsible for, but the prophet alone is given the right to receive it for the church as a whole. Although the prophets and apostles carry out various administrative duties, their primary purpose is to testify of the Savior. Just as Jesus’ apostles served as special witnesses to Him when He lived on earth, apostles today, and in every generation before and since, are instructed to testify of the divinity of Christ and to teach the people of His mission and His atonement. The president of The Church of Jesus Christ of Latter-day Saints is a prophet, seer, and revelator. Each of these terms has a specific meaning attached to it. A seer is a higher gift than the gift of prophecy. He is one who sees things we can’t see with our natural eyes. This describes Moses when he saw God, for instance. It describes prophets who have seen visions. A revelator helps people to know of something that wasn’t known before. When a prophet explains a doctrine the people hadn’t previously heard of, he is being a revelator. When Joseph interpreted the dreams of the pharaoh. The president of the Mormons is all of these things, as well as a witness of Christ and the president of the Church. The prophet isn’t considered holy or divine in any way and he is not worshipped. He is honored and respected, but only God and Jesus Christ are worshipped.